The knitted climbing vine lace pattern features a strong vertical element. The climbing vine lace pattern is composed of 4 rows. The wrong-side rows are plain with the exception of the single knit stitch in each repeat. The rest of the pattern is pretty straightforward. 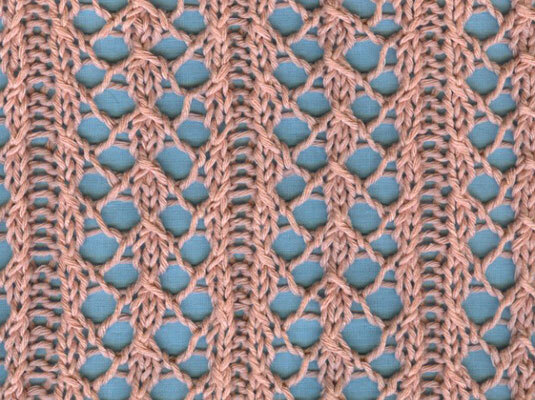 The blue background shows off the pattern in climbing vine knit lace. Row 1 (RS): K1, p1, *k2tog, yo, k3, yo, ssk, p1; repeat from * to last st, k1. Row 2 (WS): P1, *k1, p7; repeat from * to last 2 sts, k1, p1. Row 3 (RS): K1, p1, *k2, yo, sk2p, yo, k2, p1; repeat from *, k1. Row 4 (WS): P1, *k1, p7; repeat from * to last 2 sts, k1, p1. Repeat these 4 rows for the pattern. To practice the climbing vine lace pattern with a swatch, cast on 27 stitches. Work through the 4 rows of the pattern until the swatch measures 6 inches, and then bind off.